The Maynard Building, originally known as the Dexter Horton Building, was designed by architect Albert Wickersham in 1892. The building was designed to house the Dexter Horton Bank. This building has beautifully composed elevations, fine detailing and delicate Romanesque Revival carving. It has been praised by many, including Sally Woodbridge and Roger Montgomery, who stated in A Guide to Architecture in Washington State: “The most sophisticated of the Chicago School buildings of the area, it is true to the Sullivanesque principle of weaving spandrel and pier to create a refined and structurally expressive design.” Jeffrey Ochsner and Dennis Andersen have also pointed out echoes of the buildings of Burnham and Root and more specifically of the now demolished Insurance Exchange Building in Chicago. If anything the Maynard Building is perhaps very slightly more sophisticated, in its balancing of rectangular and arched forms, the overall unity of the composition and the restraint and delicacy of the carved ornament. Albert Wickersham arrived in Seattle in 1889 as a representative of A. B. Jennings, a New York architect. He was the Supervising Architect on the initial phases of the Denny Hotel in Seattle, later demolished thanks to the Denny Regrade. He had an independent practice by 1893. Despite the work on the Maynard Building, he appears to have received few commissions outside of this building and Seattle Hardware that allowed him to show off his full design capabilities. 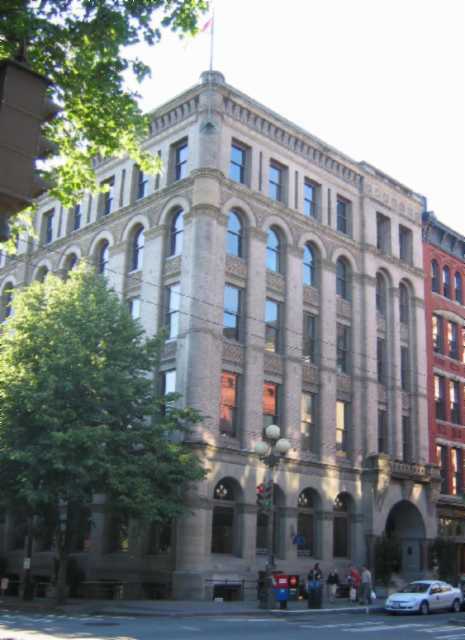 (The Seattle Hardware Building is also a located in the Pioneer Square-Skid Road National Historic District at 83 King Street - See Field Entry 50). Dexter Horton was born in Seneca Lake, New York in 1825 and raised on a farm 70 miles from Chicago. He arrived in Seattle in 1853, as part of the Bethel Party, Seattle’s second covered wagon expedition, which also included Thomas Mercer, the Reverend Daniel Bagley and their families. He and his first wife worked in Henry Yesler’s mill, while he also helped Thomas Mercer with his hauling business. Horton later started a general store on First Avenue and Washington Street. It was as the manager of the general store that he began to safeguard fishermen and loggers’ money by placing it in sacks and hiding the sacks in various parts of his store. Through an advertisement, he eventually acquired a small safe, which apparently had no back. After a stint in San Francisco in the brokerage business, he returned to Seattle in 1870 with a more proper and heavy steel safe and a better knowledge of banking. He established the first real bank in Seattle in a one story stone house, a building which partially survived the Fire of 1889. In any case, the building’s bank vault preserved the money it contained. The present building was built on this site and became the new bank building. Dexter Horton’s bank later became Seafirst Bank and is currently the Bank of America. 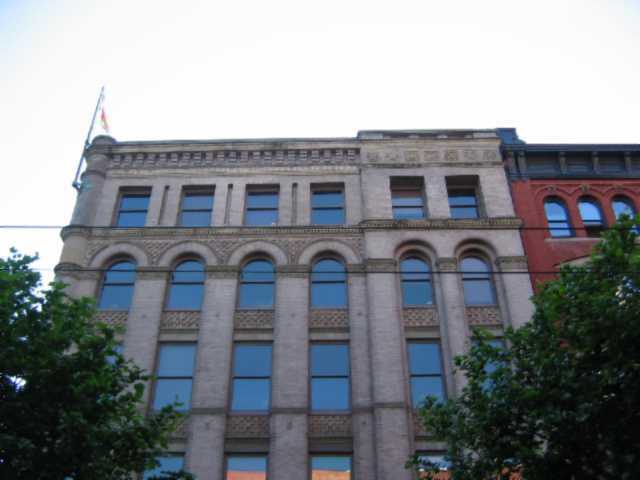 This is a five story building clad in buff brick and sandstone. It is rectangular in plan and also has a basement level, partially visible from the street. It has a shorter main elevation on First Avenue of six bays and a secondary street elevation facing south on Washington Street, consisting of two sets of five bays, separated by a continuous pilaster, which rises to the cornice level. The cornice is somewhat elaborate and includes a dentil band of corbel shapes and a tower-like ornament at the southeast corner of the building. The tower-like ornament is also extended down to the ground level by an engaged cylindrical shape set on a circular plinth. In general, ground level openings on the first level are simple arched openings in sandstone. The typical vertical bay above the ground floor is mainly clad in brick and has two levels of trabeated window openings, surmounted by an arched window opening. Spandrels consist of a checkerboard pattern of squares, with every other one recessed slightly. Above the fourth floor, is a belt course including a dentil band. The top level windows are rectangular in shape. The Washington Street elevation has two sets of five similar bays. Below the second level of the five western bays of the Washington Street elevation, are three sets of wide rectangular openings at the ground level. The main First Avenue South is not symmetrically composed: It has four similar bays, followed by two slightly projecting bays at the upper floors surmounting a striking entry portal at the ground level. The portal has a low slung arch and elaborate Romanesque Revival carving. The ornamental carving of the entry portal consists mainly of interlaced floral patterns with an occasional small carved head. Two short round columns at each side of the entry arch have shafts of pink marble and carved sandstone capitals. Woodbridge, Sally and Roger Montgomery. A Guide to Architecture in Washington State. Seattle: University of Washington Press, 1980. Bagley, Clarence B. History of King County. Chicago: S.J. Clarke, 1929.